Facet joint degeneration describes the aging of these specialized spinal structures and the subsequent consequences on their form and function. 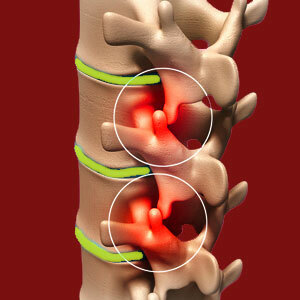 Degeneration is one of the most commonly used words to describe the spine. Doctors casually toss around the word in relation to the intervertebral discs, the vertebral bones, the spinal ligaments and of course the facet joints. All of these tissues do degenerate, which simply means that they get older. Therefore, there should be no stigma or shock associated with the word, since structural deterioration is a universal reality for the human species. We see no problem with using the word degeneration for diagnostic purposes, as long as the patient understands the facts and the mostly harmless nature of facet joint aging. However, when the term is combined with other ludicrous nomenclature, then the diagnostic effect can injure with traumatic impact, providing considerable negative nocebo effect to the patient. We see this often with the diagnostic term degenerative facet disease. This report examines facet degeneration from an objective, factual viewpoint. We will not seek to inspire fear with this writing, but instead simply inform patients of what is really happening inside their spines when they have been diagnosed with degenerated facet joint conditions. Degeneration means to breaks down structurally. As we age, every part of our body degenerates due to the passage of time, the effects of injury and activity and the genetic makeup of our cells. No body part or system is immune to degeneration. This is a natural fact of getting older. While most people seem to understand this plain truth in theory, they are often shocked when a doctor uses the term degeneration to refer to their spine. Of course the spine deteriorates. It is a part of you and your entire body is slowly breaking down year by year. This is the natural progression of life towards death. It is as simple as that. There is nothing unusual or unexpected about facet joint deterioration. It is simply unavoidable and is usually nothing of clinical consequence anyway. Remember, it is the rare exception to the rule when facet joint pain truly occurs from typical degeneration. In the facet joints, degeneration takes the primary form of escalation of the arthritic processes. The protective joint structures deteriorate and the formation of bone spurring occurs. Simultaneously, the synovial fluid in the joint capsule dries up and the joint is left unlubricated and therefore rough during movement. Many people also demonstrate deterioration of the ligaments that surround the facet joints. These tissues might suffer hypertrophy or ossification, which can compound the structural changes in the facet structures. All of these terrible sounding alterations are normal. In only a few cases will any of them produce any significant pain or related symptomology. Research science has not shown any particular form of spinal degeneration to be inherently pathological. Mechanical pain can occur when bone spurs interfere with typical joint movement. Results can include painful mobilization of the joint, hypomobility of the joint or complete fusion of the joint. Facet joint nerve compression occurs when the very small neurological tissues that innervate the facet capsule itself are compressed by osteophytes. Pain is usually minor to moderate, triggered by movement and extremely localized. Nerve root compression is not actually a part of facet syndrome, but it can be caused by facet osteophytes that encroach on the neural foramen. When this opening is reduced in effective size, compression of the exiting nerve root may occur, causing symptoms in the area of the body innervated by the compressed nerve. As mentioned in the opening section, facet joint degeneration is normal. This is a fact that you must understand. The vast majority of facet joint age-related changes will not be painful now or ever; at least not to any degree that requires medical care. Of course, we might get a few minor aches and pains as we get older, but this is expected and should not cause anxiety or fear. Quite the opposite, viewing these changes as normal can actually go a long way in preventing them from gaining symptomatic potential, according to many noted medical studies. To further your knowledge of the exact changes that occur in the zygapophyseal structures from age and activity, please continue on to read our essay covering facet joint arthritis.